Supports healthy blood sugar levels and blood lipid levels while enhancing insulin metabolism with its powerful nutritional extracts. 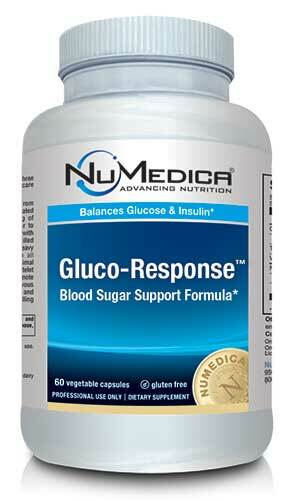 NuMedica Gluco-Response is the ideal blend of vitamins, minerals, and herbs for maintaining healthy blood sugar levels. With its potent plant-based extracts and nutrients, NuMedica Gluco-Response supports optimum glucose levels and enhances insulin metabolism. In addition, if you are looking for a natural supplement to support healthy blood lipid levels like triglycerides, you can benefit by trying this popular nutritional supplement. NuMedica Gluco-Response features extracts like fenugreek, gymnema, and bitter gourd that have long been known to have a positive impact on blood sugar levels in the body. Native to the Near East, fenugreek is cultivated the world over today. A popular culinary herb, fenugreek has also been used in traditional medicine to treat various ills like stomach complaints. Some recent studies have suggested that fenugreek may have the ability to reduce blood sugar levels. Gymnema is a powerful medicinal herb that is also associated with blood sugar regulation. Bitter gourd, popularly eaten in Asian countries, has been used in the treatment of diabetes in many traditional cultures that rely on natural ingredients to support wellness. Bitter gourd also enhances the metabolism of carbohydrates in the stomach, which makes it an ideal inclusion in NuMedica's powerful natural formula. NuMedica Gluco-Response may also provide support for maintaining healthy blood lipid levels. It's essential to maintain healthy levels of cholesterol and triglycerides, and this supplement relies on the power of natural extracts that target blood lipids for improved regulation. An excess of blood lipids increases your risk for cardiovascular disease and heart attack, which is why many people rely on nutritional supplements to help reduce these blood lipids so that they fall within a normal range. Directions: Take two capsules daily after meals or as directed by your healthcare practitioner.